Ensuring we have the correct posture when we’re walking, standing and sitting is constantly drilled into our brains; but what about our posture when we’re sleeping? If you often wake up with a stiff neck or aching back, it’s likely that you have poor posture whilst you’re sleeping. But how are you supposed to improve your posture when you’re in the land of nod?! We present to you the new and improved Side Sleeper Pillow! Sleep specialists say that sleeping on your side is the most comfortable way to sleep, unlike sleeping on your back or on your stomach, as it decreases the likeliness of an interrupted sleep. It is advised to sleep on your side if you suffer from pain in the lower body and also if you are pregnant. Using the Side Sleeper pillow will be effective in supporting your neck and head to provide the best posture whilst you sleep. Experience an absolutely energising, restful sleep like no other! It’s very important to make sure that you’ve got the right pillow to ensure a heavenly sleep; if you have the wrong pillow for your favoured position it can sometimes create sleep disorders and disruptions. 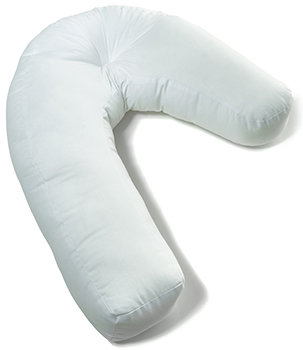 The Side Sleeper Pillow is extremely useful for anyone who sleeps on their side. Never lose sleep over bad posture again; enjoy the most restful sleep possible with the Natural Health Supports Side Sleeper Pillow. Doesn’t just help you sleep – beat snoring and ear pressure! We understand the importance of your beauty sleep; there’s nothing more frustrating than when your dreams are interrupted with the sounds of your own snoring! That's certainly not what sweet dreams are made of. The upper body alignment encouraged by the Side Sleeper Pillow helps to stop snoring by opening up the air passageways. Designed with expert medical knowledge; Dr Larry Cole created the Side Sleeper pillow to provide ultimate support to your upper body, protecting your spine and neck alignment. This gives you the optimum sleeping experience you deserve – it even has a special ear-well for maximum comfort. This helps to alleviate ear pressure – this will be a huge relief to you if you often suffer from annoying clicking, popping or fullness in your ear canal. Don’t let allergies keep you awake! Not only does it ensure a more improved posture; the Sidesleeper is made from hypoallergenic hollow fibre which can aid in easing off those snores as it causes fewer allergic reactions. The pillow can be machine washed at 30 degrees, so it’s really easy to keep it free of dust and other particles that could aggravate your sinuses. You can continue being the Sleeping Beauty that you are, with zero interruptions. The Sidesleeper pillow is made from hollow fibre that allows air to circulate while you sleep.. No more waking up in the middle of the night to turn the pillow over - you can stay cool headed all night long! It’s also fire safety compliant and machine washable, so you can rest easy without worrying about maintaining your pillow’s cleanliness! The many special air circulating construction also creates a moisture wicking effect that will instantly evaporate sweat, perfect for people who suffer from night sweats or uncomfortably high body temperatures. Blisfully aligned nights sleep for side sleepers.